Older Jaguar’s attempt at entry level luxury sedan segment hasn’t run especially smooth with brand lovers. Borrowing a platform from Ford Mondeo, which also implied neglect of rear wheels and as a result brought the vehicle that could be only powered in AWD configuration, hasn’t suit well brand’s premium aspirations and respectable heritage. Well, not exactly… SVR version is definitely coming as spy shots are suggesting, but in the meantime, something much “harder” is already here. If you managed to remember the previous situation when Jag used “project” word, you certainly could recollect the unusual side of it. This time Brits haven’t been so expressive on the outside, though we are far from the usual stuff, while biggest attention is dedicated to under the skin area. RS, AMG, M, V, F are left to be tackled by future SVR, while this “project” is heavily limited to 300 units and is a story for itself. Feel free to confront it directly to BMW’s M4 GTS or relatively to Ford Mustang Shelby GT350R and Chevy Camaro ZL1 1LE (until Z/28 arrives). Though the body is still usually shaped when you compare it to the “project-ised” F-Type, applied styling might as well tell you all about special XE’s intentions. Widened wheel arches, a large wing at the back, black theme covering a bunch of body parts, huge ceramic rotors, big front lip and side skirts, front bumper infested by grille’s honey-comb pattern and carved hood and rear bumper are screaming all about its track orientation. On the inside, sporty seats or ultra slim multi-point harnesses ones as an option, carbon trimming and possibility to exchange rear bench for the metal cage, seals the deal. 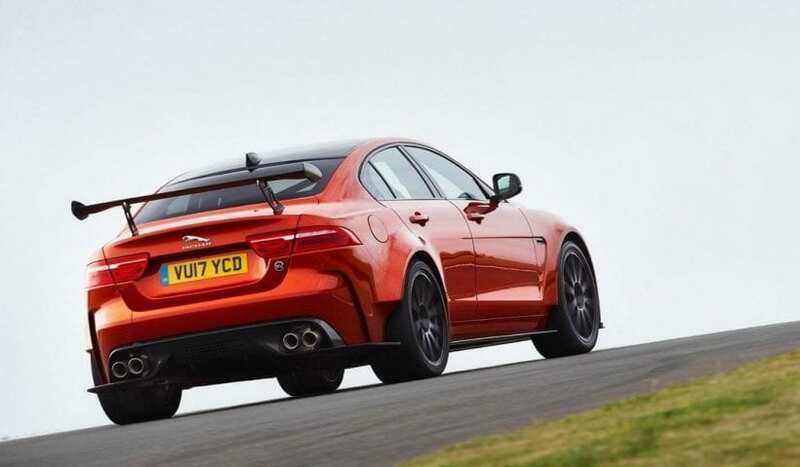 Unlike the 2018 Jaguar XE SV Project 8 which kept things unchanged under the hood, Project 8 is a mind-blowing thing, as it is miles apart from current XE’s top S version. Though so striking part of it, would mainly be due to the fact that SVR version hasn’t arrived yet, but let’s not spoil the moment here. If you are familiar with Jaguar and Land Rover engine line up, then you are pretty sure what powers this angry cat. Supercharged 5.0-liter V8 pumps out astonishing 592 hp making M4 GTS feeling underpowered. 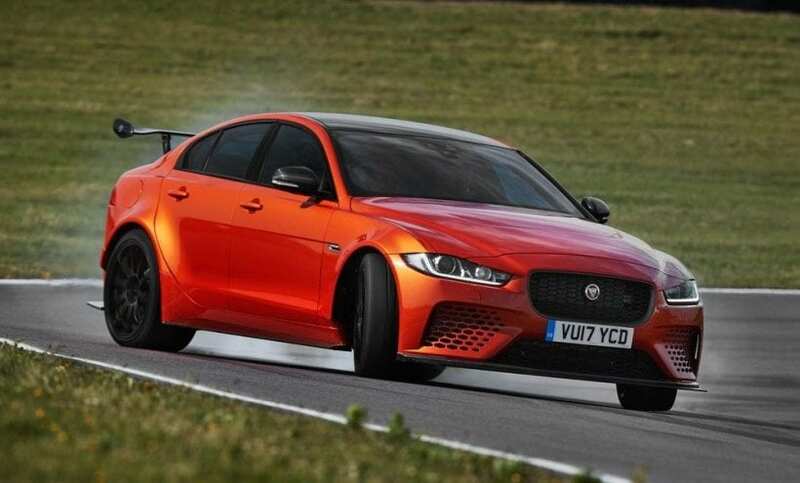 This is the fastest Jag of all times capable of reaching 60 mph in 3.3 seconds, which even tops mentioned Beemer by one tenth of a second. Beefy V8 is matched by specially calibrated 8-speed ZF automatic, which stroll through the gears in no more than two-tenths, while the whole ordeal is capable of 200 mph. Power is sent to all wheels while rear axle feature torque vectoring differential. Above mentioned rear wing can generate 269 pounds of downforce at 186 mph, while before that car can drop itself by 0.6 of an inch when you put it in the track mode. The whole thing is kept on the lighter side of the spectrum with carbon-fiber bumpers, fenders and rear diffuser, which shaves over 200 pounds from weight figures. Price is not disclosed yet, but expect something in Munich’s offer area of $130k. 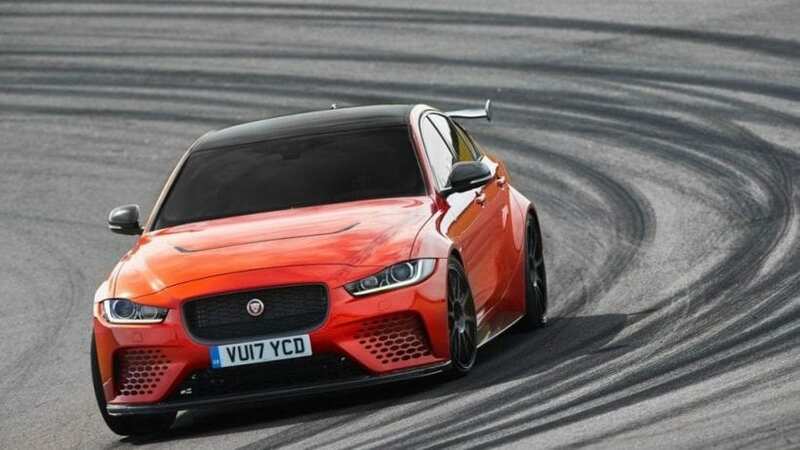 Despite 2018 Jaguar XE SV Project 8 is going to be a hard thing to get and even harder to see, nice move from Brits nevertheless. We need to add that one of our sources predicts much higher price and that could be the thing spoiling the whole picture of this marvel on the wheels. According to that report, it could go up to $190k which is quite high but have in mind what you are getting with this car.